I’ve always liked Virtual PC, and it was a shame IMHO when Microsoft twisted this fantastic utility in some glorified IE6 box, A’la “Windows XP Mode” for Windows 7. So I downloaded and installed VMWare Player, as I’ve heard you can use it to run ESX among other things requiring hardware acceleration, and player fits the bill for being cheap. Passing the hardware acceleration to a child VM is a matter of checking a single box in the settings. Namely the ‘Virtualize Intel VT-x/EPT or AMD-V/RVI” box. Although you don’t have to click it if you want, it just offers greater performance. Now I installed my old copy of XP x64, as I felt like something different, then I went ahead and installed Microsoft Virtual PC 2007 sp1. The installation was pretty uneventful. Now with that out of the way, I could setup a VM,and I decided to install OS/2 1.21 for the heck of it. And it booted up no problems, like it did back in the XP days. I even ran it with and without CPU acceleration and it works on both, but is noticeably faster with acceleration. So I thought this was interesting, although Virtual PC has been essentially dead ended, it can go on with an older OS in a VM, to let you run VMs. I would imagine that if VMWare Player could run Virtual PC 2007, that 2004 should work as well. 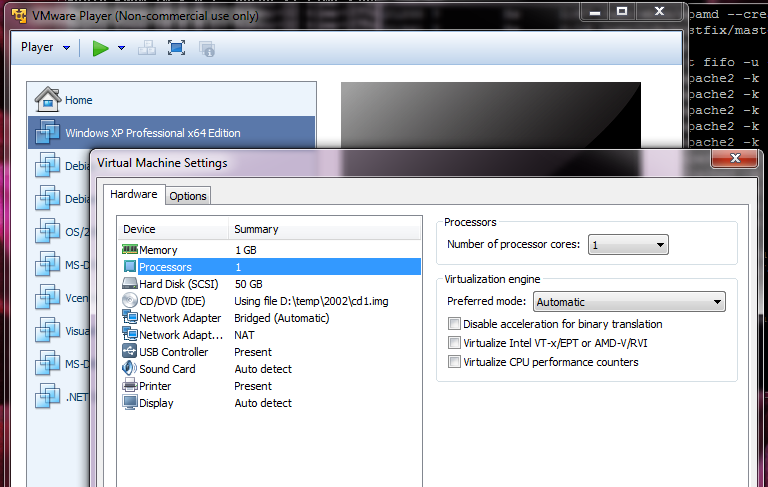 You may have to play with the hardware acceleration settings in VMWare… ? Also are you using XP, XP64, or 2000…? Nice. I currently also run VPC 2007 and the older VirtualPC 4 (before it was a Microsoft product) in VirtualBox, where it runs nicely as well. I’ve been experimenting with a number of virtual machines within virtual machines and find it is a nice way to preserve older, unsupported software, but I never did test VMWare player. 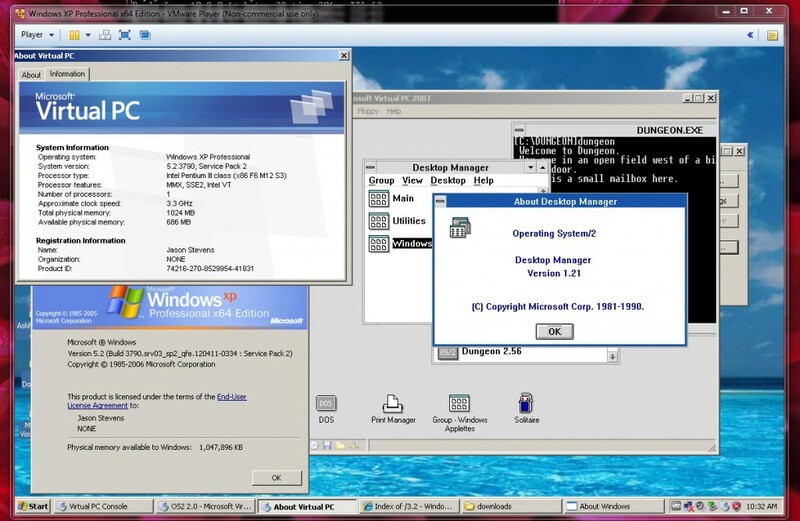 @ampharos – I’ve set up a “virtual xp” 32-bit guest inside of VirtualBox and I’m able to run Windows Mobile 2003 and 2003 SE in that system. 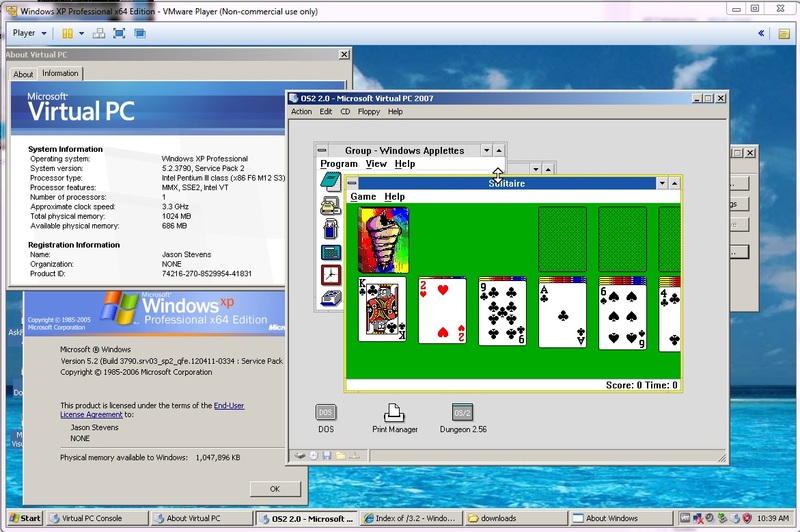 I’ve also had success running Windows Moible 5 – Windows Mobile 6.5 in a virtual Vista guest under VMWare Workstation. I think those later versions may have required Vista or later? I always remember getting some error saying you shouldn’t be doing this… Somewhere I think I still have a copy of Connectix Virtual PC that’ll run on NT 4 somewhere… I think. I played around with VirtualPC 2004 running on the Windows XP guest machine in VirtualBox and it’s operating pretty good, although, it’s slow with hardware virtualisation enabled. I’m wondering if it’s possible to get VMware Player and DOSBox running inside VirtualBox. DOSBox doesn’t have hard CPU hooks that I’m aware of so it should run under pretty much anything..
Also I think VPC 2004 only requires a Pentium III, So I think it may even run on machines without VT… But I’m not 100% on that. The latest version of VMware Player tested under VirtualBox is version 3.1.6. Starting with version 4, VMware Player will refuse to install, because it requires various CPU instructions that are not present in the VM-emulated CPU. DOSBox should run okay under VMware, VirtualBox…even VirtualPC. However, if you want to use mouse support, VM mouse support has to be disabled. Try setting the OS for VirtualBox to Windows 8.1, as that enables a bunch of extra virtual CPU features (it’s also possible to enable them manually with vboxmanage command, but changing the virtual OS is simpler). I’ve played around with various nested virtualisation setups mainly for fun, but occasionally also to get an OS to run which refuses to play nice with the “outer” hypervisor. wow and I thought I was crazy! that’s a great list!! I once did VMWare Workstation -> Windows 8 Hyper-V -> XP -> VirtualBox -> XP. Ran slow as hell. Another time I installed NT4 in twoOStwo running in Windows 2000 under VMWare Workstation. I’ve found that stuff to be quite addictive 🙂 The ability to virtualise VT-x has been there since VMware ESXi 5/Fusion 4/Player 4/Workstation 8 but was a hidden feature in Fusion and ESXi first. Yeah, I’ve often noticed that while Fusion has the same features as Workstation, the more “interesting” ones are likely to be hidden and only accessible by editing configuration files. Nested VT-x is one example, creation of a DHCP-less host-only network is another in the case of Fusion 4. On the other hand, with Fusion being significantly cheaper than Workstation, that may be purely intentional. I’m pretty sure that VMWare uses the same virtualization kernel in all of their products, it just packages it differently. Hint: create an empty file (0 bytes in size), set it as floppy image, and tell VMWare to boot off it. I’m pretty sure it’s the same as well… But I’m too scared trying to boot off an empty file… I suspect it’ll end poorly. Looking at your screenshot, are you using Windows 7? I have VirtualPC 2007 running just fine under native Windows 7. I was wondering what kinks you ran into if it doesn’t work for you. I know you have to swap some device driver out with another one from some windows ce emulation thing (that was virtual pc, before MS gutted a fine product). I just haven’t bothered trying to load it natively… I was more interested in VPC 2004 actually as it can run NeXTSTEP 3.3 pretty well. Running a virtual PC does not give as a full featured PC! It has so many limitations. I personally do not enjoy it. I don’t think you understand how versatile virtualization is. Some of us don’t have the space for 30+ machines. Fun stuff. I tried installing VMware Workstation 1.0 in a VM once but sadly didn’t get very far with it due to a plethora of errors it spat out at me. That is really too bad. But strange enough that it’ll run ESX. I should dig out my old ESX 2.5 stuff and see if that works. Previous Previous post: 50 years of BASIC! OS/2 and virtual COM ports.